CHARLOTTE– Capping off an eventful week on the Charlotte sports scene, less than 24 hours removed from a thrilling Overtime comeback by the Hornets (no typo), the Panthers will host the New Orleans Saints on Thursday Night Football. Although both clubs have struggled through the first half of the season, the week 9 division game has first place in the NFC South on the line – a division that looks to be a two-horse race for a home playoff game. The Saints (3-4) are looking to pick up their first road victory of the season, while the Panthers (3-4-1) aim to get back to their early season success, when they started 2-0. To end their 3-week winless skid, they’ll need consistency from unfamiliar faces on the offensive line, and to carry over their defensive success from last Sunday’s game against the Seahawks. With DeAngelo Williams and Jonathan Stewart on the field together for the first time since week 1, they’ll also need to capitalize on a New Orleans defense currently giving up over 100 yards per game on the ground. CONSISTENT POCKET: The Panthers will start 4 undrafted players on the offensive line tonight. A unit that entered the season under the microscope has since been decimated by injuries. Canadian rookie David Focault will lead a group of practice squad call-up’s responsible for protecting Cam Newton’s blind side. Anchored by 4-time Pro Bowler Ryan Kalil, the line (along with on-field backs and tight ends) need to be disciplined in their pass protection responsibilities to create a consistent pocket for Newton to work from. Protection has been better in some outings than others this season, but has yet to truly be consistent – As in: the pocket tends to look great on one play, and completely collapse the very next. Specifically, the offense struggled against the exotic blitz-package of the Steelers in week 3, a scheme which Saints defensive coordinator Rob Ryan likes to pull from. The Panthers should be able to run the ball on New Orleans, but if they can give Cam Newton time to work as well, Kelvin Benjamin and Greg Olsen have the talent for big games against a suspect secondary. STOP THE BIG PLAY: It’s obvious that the Carolina defense regressed after an impressive 2013 campaign — losing key contributors Greg Hardy, Mike Mitchell, and Captain Munnerlyn was a larger blow than anyone, myself included, predicted. But the box scores that reflect defensive performance have been somewhat misleading through 8 weeks. Carolina’s stats for Total Yards and Touchdowns given up – which are the two leading elements that help determine total defense ranking – have both been skewed considerably by it’s allowing of “explosive plays” (20 yards or more). In 2014, the Panthers have allowed 8 touchdowns that came on explosive plays alone, the most in the league. Of the total yards they have allowed this season, over 1,000 have come on such plays. They rank “top” 4 in the NFL in several categories in that respect. While that may not sound very promising, any coach will agree that it is much more correctable than allowing opposing offenses to sustain long, methodical drives. There have been several plays of over fifty yards allowed that have affected the course of this young season: Giovani Bernard’s 89-yard TD run, Steve Smith’s (2) TD receptions, Aaron Rodgers’ 59-yard TD pass to Jordy Nelson. All of those plays could have – and should have – been stopped with a proper pursuit angle, more disciplined coverage, or just better execution by one particular player. Against a New Orleans team that thrives with the explosive play: the Panthers defense must remain disciplined, fulfill their individual responsibilities, and make Drew Brees beat them underneath on every throw. If they can build on their improved outing against Seattle last week, Brees has proven that he is not the same quarterback on the road this season and will turn the ball over. GET OLSEN MORE INVOLVED: One of the few bright spots on the Carolina offense this season, tight end Greg Olsen is on pace for yet another career year. He has been the most consistent player, perhaps on either side of the ball thus far. His route-running ability, deceptive speed, and sure hands have brought him up to the elite tier of tight ends in the NFL – especially with injuries to Jimmy Graham and Rob Gronkowski. But being considered one of the best comes with more recognition from opposing defenses as well. Last week, the Seahawks made it a point to mark Newton’s number one option, bracketing him with coverage and rolling safeties to his side of the field. However, in a game where he was targeted a season-low 3 times, there were more opportunities to be had. Due to inconsistent line play and the strength of Seattle’s front seven, Newton failed to capitalize on throws that should’ve gone Olsen’s way. Against the Saints, look for Olsen to see more work – especially in the red zone – where Kelvin Benjamin let a touchdown reception slip through his hands last week. Getting the tight end more involved inside will only open up more opportunities for the rookie wideout to make plays outside the numbers. WIN THE TURNOVER BATTLE: Must I elaborate? This is a key to victory for every team, in every game. It starts with pressuring the quarterback, which forces the ball out earlier – in effect not leaving your cornerbacks exposed for 6 seconds or longer. Against a speedy receiving core, that is a top priority. Josh Norman’s addition to the starting lineup made for an improved secondary last week, but New Orleans has too many weapons to cover on extended-routes. Get to Drew Brees, and allow the safeties to make plays on errant throws. 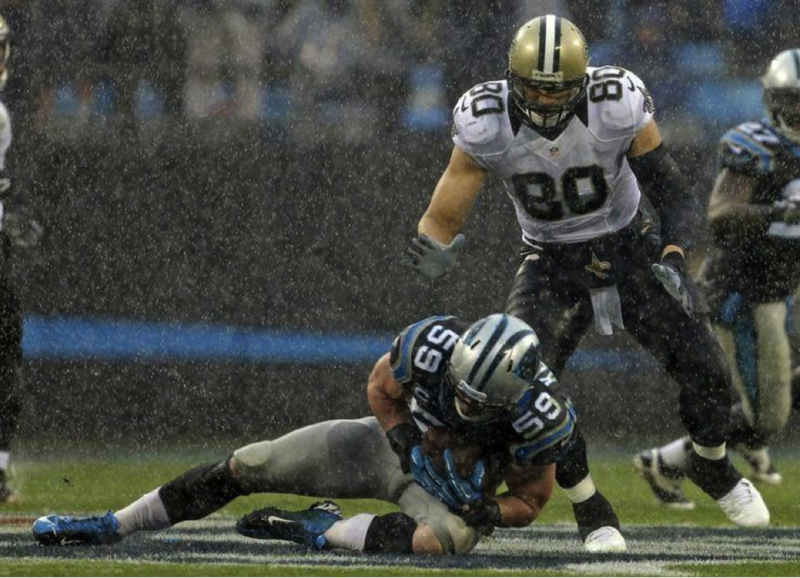 In last season’s week 16 win against the Saints, Carolina sacked Brees 6 times and intercepted him twice. In their losing effort two weeks prior, they got to him only twice and had zero takeaways. Possessions are extremely valuable against New Orleans, who can score at any time. -Panthers have won 3 of last 4 against Saints. ← THE BUZZ IS MOST DEFINITELY BACK!! !